Two Armed Robberies Within Minutes in N.H.
Police are investigating if the incidences are related. 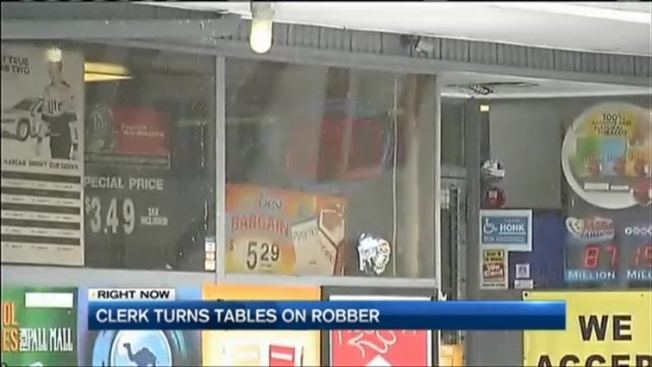 A store clerk in Manchester New Hampshire turns the tables on a man trying to take his money. Now police are trying to determine if the same suspect is responsible for another store robbery five minutes later. "He said, 'I have a weapon, give me your money,'" said 61 Best Market Manager Sabir Sheikh. According to the surveillance video, a man looking to rob the store messed with the wrong guy. "I got a pretty good grip of him and hit him a couple times," Sheikh said. "I got in a few headshots." Sheikh says the masked man showed a gun but when he realized it was fake, Sheikh says there was no way he was handing over his hard earned cash. "For me to stand here and someone come here and take my money, that's not how it's going to work," Sheikh told NECN Wednesday. "The only thing he made off with was a few punches in the face." Police say five minutes later, the were dispatched to Shawn's Corner Market just about a mile away for another robbery. The clerk who doesn't want to be identified tells NECN that he was most worried about the one customer in the store at the time. "He said, 'on your knees,' to the customer and the customer was on his knees and bending down to the floor and he said, 'take out all your cash,'" the clerk recalled. The clerk says he did everything the suspect demanded. "I took all the cash and handed it over and he asked me for more money," the clerk said. Sheikh admits he should've done the same and is advising his employees not to react the way he did. "It's not worth it to risk any of their safety over a couple bucks, money is just a thing," Sheikh said. Sheikh says his store has never been robbed before, but he's not surprised it happened Tuesday night. He says he's seen the drug epidemic in the city force people to do crazy and desperate things for money. Detectives are trying to figure out if the two crimes are connected.